My school is celebrating English Week next Monday. It will be an exciting week for me again and I can't wait for it to come. After going through the BM Week, I was initially not very determined to participate in the English Week. As Mami advised me, "Let others have a chance to win trophies this time". However, everyone had to participate during the elimination week. Last week, we had an adhoc spelling test. The words were not given to us before. The best 3 with highest scores in each class would enter into the Spelling Bee Finals during the English Week. I did well, and was chosen for the finals. Here are my results. After that, we had a "Show and Tell" elimination session. 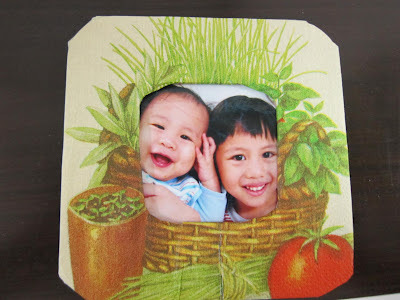 I brought my favourite photoframe because I handmade this during my last birthday and it was a picture of my little brother and I. I was 4 years old back then, and Shaun Shaun was still a baby. God was gracious, and I was also selected for the "Show and Tell" finals. There were 5 students in each class who entered into the finals. There would also be a colouring contest tomorrow, but I have never won any colouring contest before. And finally, there would be an opening ceremony of the English Week after assembly next Monday. I was chosen with 5 other students from Primary One to dress up like an Englishman. I will be wearing a suit, to walk (with a beautiful classmate of mine) into the hall for the opening ceremony. I am not quite sure what I need to do, as the rehearsal would only start today. I thank God for His favour and I am indeed happy to be able to actively participate in my school activities. Ooh...before I forget... there would be a Mandarin Week too..... in the month of September. I wonder if I am good enough to participate. This would certainly be a difficult one for me. Wow...Ben is doing very well in school. That's great....good to see them progressing and thanking God for it.